Granules « Global Market Insights, Inc. The rising requirement to maintain workplace & household cleanliness will stimulate sodium lauryl sulfate (SLS) market, pertaining to the fact that SLS is one of the main constituents of various detergents and cleaners. Of late, there has been a growing concern among consumers regarding environmental cleanliness and a healthy livelihood, which will undeniably enhance the product demand. Regional governments have also been undertaking initiatives regarding the same and have deployed strict regulations to maintain cleanliness, thereby propelling sodium lauryl sulfate industry share. The increasing requirement of household detergents and cleaners in various sectors is also slated to create lucrative opportunities for SLS industry giants. According to Global Market Insights, Inc. “Worldwide Sodium Lauryl Sulfate (SLS) Market, having had a revenue of USD 450 million in 2015, will generate a significant valuation by 2024, growing at a CAGR of more than 5% over 2016-2024.” Emerging nations across the globe are fueling the requirement for personal care products and detergents on a large scale subject to the improving purchase parity of consumers. This factor will also impel Asia Pacific sodium lauryl sulfate industry size, which was worth more than USD 100 million in 2015. This regional business is anticipated to generate significant revenue by 2024, with an annual growth rate of 5% over 2016-2024, owing to the implementation of strict norms to maintain cleanliness and hygiene. Escalating commercialization of hair care and dermal products across the world will stimulate the demand for personal care products noticeably. Consumers have been giving preference to personal care products such as soaps, scrubs, shampoos, facial creams, bath bombs, which will augment SLS industry growth, owing to the fact that SLS is primarily used in various personal care products. 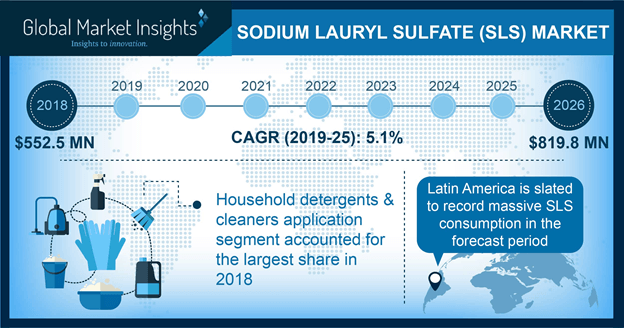 As per estimates, sodium lauryl sulfate market share from personal care applications generated a revenue of USD 90 billion in 2015 and will register considerable annual growth rate over the coming timeframe. Moreover, growing consciousness among the people about their personal health and hygiene will influence the market share positively. North America sodium lauryl sulfate market, with U.S. at the helm, covered over 15% of the business share in 2015 and will collect considerable revenue by 2024. The expanding personal care products and detergents sectors will stimulate the industry size. Shifting trends toward the usage of organic personal care products will also influence the regional SLS market share, and the U.S. is undoubtedly slated to be the major revenue pocket. It has been observed that industry giants prefer to manufacture liquid products rather dry products, due to the high miscibility factor of the former coupled with its cost-effectiveness. On that note, sodium lauryl sulfate industry size from liquid forms was valued at USD 200 million in 2015, and is slated to collect a revenue of more than USD 350 million by the end of 2024. The growth can be attributed to the prominent use of liquid products in personal care and detergents applications. The noteworthy players in sodium lauryl sulfate (SLS) market are Huntsman Corporation, Dow Chemical Company, Sasol, BASF SE, Oxiteno, Solvay S.A., Galaxy Surfactants, Xiamen Ditai Chemicals Co. Ltd., Croda International, Godrej Industries, Taiwan NJC Corp., Stepan Company, Miwon Commercial Co. Ltd., Clariant Corp., Kao Corporation, and Melan Chemical Co., Limited. This entry was posted in Bulk & Specialty Chemicals and tagged Granules, Needles, Powder, SLS Market, Sodium Lauryl Sulfate, Sodium Lauryl Sulfate (SLS) Market, Sodium Lauryl Sulfate (SLS) Market Analysis, Sodium Lauryl Sulfate (SLS) Market Growth, Sodium Lauryl Sulfate (SLS) Market Outlook, Sodium Lauryl Sulfate (SLS) Market Share, Sodium Lauryl Sulfate (SLS) Market Size, Sodium Lauryl Sulfate (SLS) Market Trends, Sodium Lauryl Sulfate Market, Sodium Lauryl Sulfate Market PDF, Sodium Lauryl Sulfate Market Report.